Quibble Coinbiter is here with the coolest gear of the year! Our very own time-traveling sales moglin arrives in Battleon this weekend, bringing with him ice, snow, and really cool rare gear from the past, present, and future. Talk to him in Battleon to see all his wares, or - for all you rare collectors - get EVERYTHING he's got, plus 2 exclusive pets and a character page badge, in our Frostval 2017 Collection Chest! Many of this year's Quibble items also incorporate a Norse and/or Northlands theme as a nod to our all-new Frostval story, which begins next week. Unlock all 3 weeks of Frostval Quibble event rare gear with our 2017 Frostval Collection chest for 10,000 AdventureCoins (that is 15,000 ACs worth of gear)! The Frostval Collection Chest includes: over 30 items, plus a character page badge and 2 exclusive pets. Just want a couple of the items listed above? 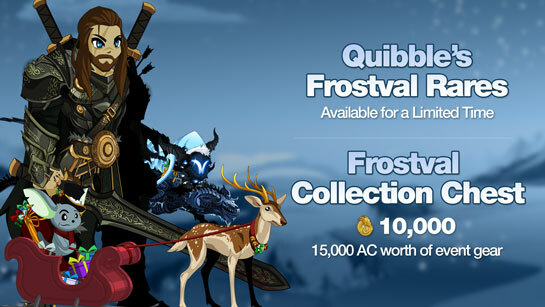 Apart from the exclusive pets, all of the gear contained inside the Frostval Collection chest will also be available individually in Quibble's shop.